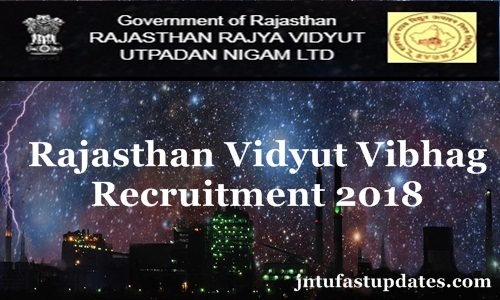 Rajasthan Vidyut Vibhag Recruitment 2018: RVUNL has issued the job notification for 2089 helper-2 posts. Candidates seeking to get RVUNL jobs can apply for the helper-II posts. Rajasthan Vidyut Vibhag inviting applications from eligible and interested aspirants through online. Aspirants can visit the RVUNL website, energy.rajasthan.gov.in to apply for the Helper-II posts. Aspirants can start applying from 1st September and the last date to apply for RVUNL Helper-2 posts is 15th September. Candidates having the suitable eligibility can apply for RVUNL posts within the announced dates. Candidates can initially go through the RVUNL Helper-II notification before applying for the announced posts. For the reference of aspirants, here we have mentioned the download link at the below of this article. Rajasthan Rajya Vidyut Utpadan Nigam Limited is the state level electricity supply corporation. The organization works for various power supply related works in the state. The RVUNL is also known as Rajasthan Vidhyut Vibhag. The organization annually releases various notifications to hire the suitable personnel in various designations. The organization has released the notification for 2089 helper posts this year. To apply for the announced posts, candidates must have the minimum educational qualification of secondary education from any of the CBSE/RBSE boards. And the age limit of the applicants must be in between 18 to 28 years. However, candidates belonging to the reservation category will get the age relaxation as per norms. Candidates interested to apply for Rajasthan Helper-II Posts 2018 can check the brief details from the following. Candidates must have the minimum educational qualification of secondary education from any of the CBSE/RBSE boards. The age limit of the applicants must be in between 18 to 28 years. However, candidates belonging to the reservation category will get the age relaxation as per norms. Candidates shortlisted in the selection process will get a good pay scale of Rs 12,600/- per month. Candidates have to pay the application fee through online using any debit/credit cards while applying for the Rajasthan Helper jobs. Candidates will have to pay the application fee category-wise. The application fee details are mentioned below. Interested and eligible candidates seeking to get Rajasthan State Government jobs and having the suitable qualification can apply from 1st September to 30th September through online. On RVUNL Official website, energy.rajasthan.gov.in candidates can find the online application form during the application dates. Click on the application link; fill up with the required details and attach the scanned copies of required documents to the application; pay the application fee and submit the application form through online.